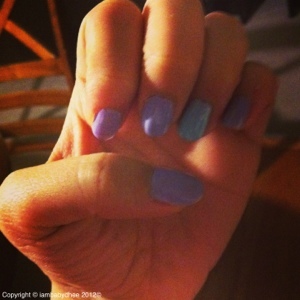 I got these really cute muted lavender polish. It was on clearance at Payless. I forgot the name of the brand, but the logo is the letter D that kinda reminds me of Derion jeans. The baby blue is from sinful colors. It's $1.99cents at Walgreens I think. It was glittery that's why I wasn't using it, but I think a little glitter in this number won't hurt.